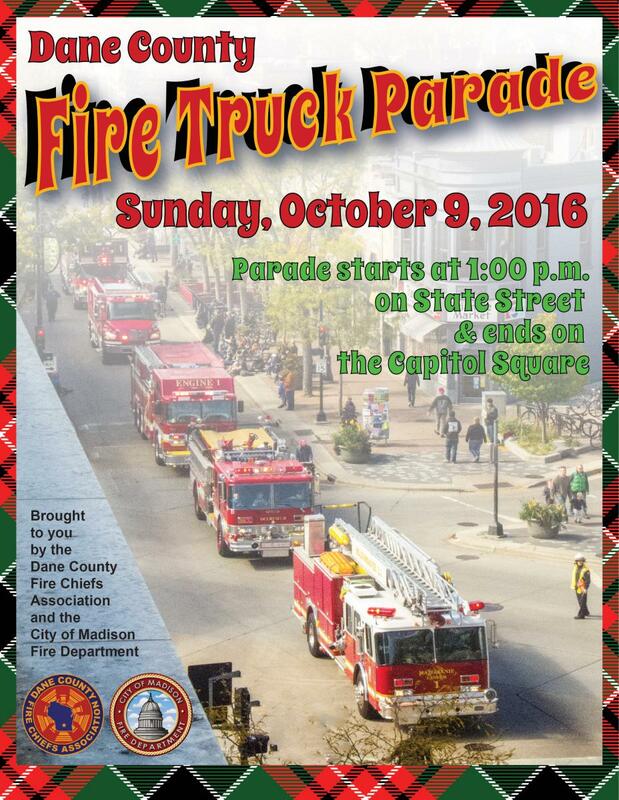 Dane County firefighters will put on their Sunday best October 9, rolling in from all corners of the county to Capitol Square for the annual fire truck parade. Nearly 40 fire engines and trucks from many of Dane County fire departments will take part in the parade, set to start at 1 p.m. at the west end of State Street at Lake Street. The parade kicks off Fire Prevention Week Oct. 9-15, the week coinciding with two of the most historic and tragic blazes in U.S. history-- the Chicago and Peshtigo fires-- both occurring on Oct. 9, 1871. The parade will head up State Street to Capitol Square, with the trucks parking on the square until 3 p.m. Kids are welcome to meet the firefighters and sit on the vehicles following the parade.